The LG Ericsson LDP-7024 phone is the reception or manager model in the LDP-7000 series digital range. 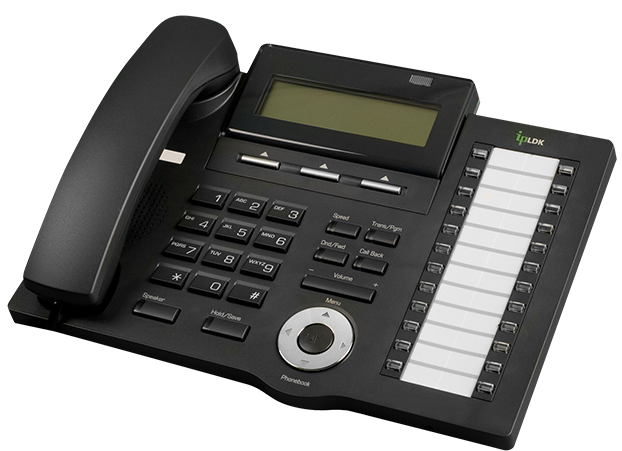 With the 24 programmable buttons it’s designed for heavy users and those involved in call handling that need more visibility of staff. It’s easy to use with the one touch operations and feature rich. For detailed information about the LG LDP-7024D phone please read below. Despite its advanced features, the LG Aria LDP 7024 phone handset looks good and it is genuinely intuitive to use. It is the flagship/ receptionist model in the LG Ericsson LDP 7000 digital phone series. It has no less than 24 flexible buttons that give the user/ receptionist unprecedented visibility over your phone system, as well as being programmable for user customisation. Larger companies can expand this functionality with an optional LG Ericsson 48 button DSS console. This connects to the side of the LG LDP-7024 phone and adds another 48 flex keys to the handset, giving you a total of 72 programmable keys to display lines, speed dials, etc. All these flex keys are activated with a single touch. For example, to transfer a call you’d simply glance at the desired colleague’s flex button on your phone. If it shows he or she is free, you’d push the button to let them know a call in coming through, then hang up to transfer the call. It’s that easy. The LG LDP 7024 also has 4 menu contextually sensitive buttons under its screen that activate the most logical menu choices, based on your current activity. For example, if you are using voicemail they would offer voicemail menu options. However, when making you are on a phone call the options would change to present functions like transfer, conference or mute. Like the smaller LDP 7016, the 7024 offers users a jog dial control interface, to let you browse the vast number of contact details the 7024D is able to store. It’s just one more way LG Ericsson lets you performs common functions quickly and simply. The 7024 phone handset is part of the LG Ericsson LDP 7000 series and it is compatible with all of the existing previous LG Ericsson models (LG Aria 24IPE, LG Aria130c, LG Aria 130, LG Aria 300, LG Aria 600) as well as the latest LG iPECS phone system solutions. If you are looking to use these handsets exclusively with the LG iPECS phone system then you really should take a look at the latest LIP 8000 IP series. The LG LIP-8024D phone is the latest IP version of the LDP-7024 digital phone handset. Very few companies will ever get a full compliment of LG Aria 7024D handsets. This is typically for a receptionist or managers. Most staff are better suited to the smaller LG Ericsson LDP-7016 phone and the LG LDP-7008 standard handset.